Asked to give examples of "wine terms," many connoisseurs would probably rattle off words that describe a wine's flavor, like "jammy" or "toasty." Wine storage involves a different vocabulary—slightly less poetic, perhaps, but just as vital for any wine collector. Whether you're beginning to discover the joys of wine collecting or want a refresher on a few key points, we've defined some of the most important terms you’ll encounter. Cooling Unit - For our purposes, a cooling unit is a refrigeration system designed to establish and maintain a certain temperature range inside a wine cabinet. Some cooling units also control humidity within that space, adding and recirculating moisture. Forced-Air Refrigeration - Forced-air refrigeration systems are self-enclosed systems that create heat transfer by forcing air across compact refrigerated coils. By contrast, standard refrigeration systems rely on broader coil surfaces that are integrated with the refrigerator to absorb and transfer heat without significant use of forced air. Forced-air cooling systems offer a number of advantages. They can maintain steadier temperatures and higher humidity levels than standard refrigeration systems, which tend to remove more moisture from the cellar environment. On the other hand, standard refrigeration systems are generally quieter than forced air systems and can better handle high ambient temperatures. When they require service, forced air systems are easy to replace because they are self-contained and portable. Standard refrigeration systems, however, are integrated into cabinets. They can be expensive to repair and nearly impossible to replace without scrapping the entire cabinet. At Le Cache, we include ultra-quiet forced-air cooling systems made by CellarPro with each of our cabinets. CellarPro 1800QTL wine cooling units are our quietest, emitting just 41 decibels of sound when installed in Le Cache wine cabinets. Relative Humidity - The amount of moisture in the air, measured as a percentage, at a given temperature. The ideal relative humidity for wine storage is about 60%. Because warm air can absorb more moisture than cold air, humidity is often reported relative to air temperature. In other words, for a given amount of moisture, the relative humidity will increase as temperatures fall. Stillness, with little movement and no disruptive vibrations. Read more about these 5 fundamental wine storage conditions and how to maintain them. Insulation - A material used to shield the temperature inside a wine cabinet from higher temperatures outside the cabinet. Not all insulation materials are created equally. A material's R-value reflects how successfully it protects against temperature changes. The higher the R-value, the better the insulation it provides. We insulate Le Cache cabinets with foil-backed polyisocyanurate, a plastic-based foam, to seal the storage space and prevent heat from infiltrating the cabinet. The R-value of our cabinets' insulation is R-10. Provenance - Refers to the origin of a wine, where and when it was produced, and how it was stored after being bottled. A wine's provenance determines its value. 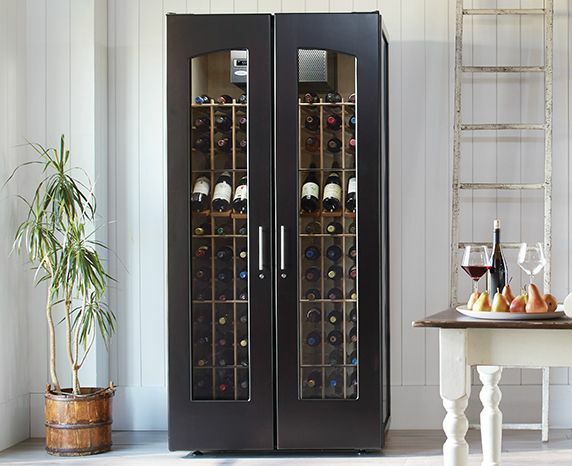 Storing your wine properly, as in our temperature-and humidity-controlled wine cabinets, gives your collection a strong provenance and will increase its value in the event that you choose to sell your wine. If you age wine as an investment and plan to sell your collection, make sure you provide ideal storage conditions for the best possible provenance. Ambient temperature outside the cabinet. The thermal load of your cabinet should determine the cooling unit you choose. For instance, with all other conditions being equal, a larger cabinet has a higher thermal load and requires a more powerful cooling unit. All Le Cache cabinets come with a choice of CellarPro 1800 Series cooling units. You can use our handy cooling unit sizing chart to figure out a specific cabinet's thermal load and select the right cooling unit for your cabinet and intended application. Ullage - The air between the liquid line of a wine and the bottom of the cork. A wine's ullage indicates, among other things, whether or not it has been stored properly. If the cork dries out due to low humidity, there will be more evaporation and possible dripping of wine through the gaps—and therefore more ullage. This undesirable result usually signals that oxidization has damaged a wine's flavor and aroma. Universal Racking - Wine racking outfitted with large 3.75-inch slots that accept Champagne-size bottles, and therefore also larger Burgundy and Pinot bottles. By contrast, standard Bordeaux-size racking has only 3.25-inch slots. Vapor Barrier - A barrier that seals your wine cabinet against infiltration of air and the moisture that it carries from the ambient environment into the cellar. Foil-faced insulation, used in Le Cache wine cabinets, creates an appropriate vapor barrier when sealed at the seams for small spaces like wine coolers and wine cabinets. Larger spaces, like walk-in wine cellars, require plastic sheeting wrapped around the "warm" side of the insulation, or spray-in closed-cell foam insulation, to create the necessary vapor barrier from ambient air and moisture infiltration inside the cellar. Without a vapor barrier, the inside of a cabinet will become too damp, possibly growing mold that can ruin bottle labels and interfere with a cooling unit’s effectiveness. If you have any questions, feel free to call one of our expert representatives toll-free at 1.877.532.2243 or ask us through a live online chat. You can also use our contact form. We’re glad to discuss your wine storage needs.